Starting to “close the loop”, heading back home. Nothing special today and will “finish the loop” tomorrow. I’ll post a wrap-up this weekend after I have a chance to digest everything. Nothing to report – slept all day. 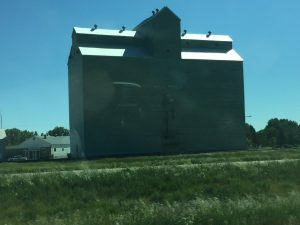 Longer drive today (longest of the trip), but it was all interstate – I90 to I94/I90 junction, continued on I-90 to I-25, and then I-25 to Cheyenne, Wyoming. Because I was going to hit rush hour traffic in the Fort Collins/Denver area, I chose to complete the trip on US85. The scenery is open and majestic – like much of the rest of the trip. 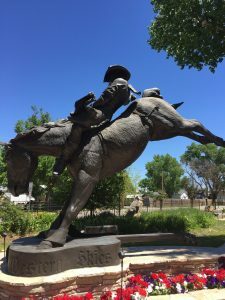 The highlight, for me anyway, was a stop in Kaycee, WY at the Chris Ledoux Memorial Park. Not much else today, but I’d like to add a thought from yesterday (that occurred to me today). Yesterday I mentioned that I followed the Missouri River south from Great Falls to the Continental Divide. What is amazing is that the water from this area of Montana eventually ends up in the Gulf of Mexico. I guess I always knew this, but I have a different perspective given I drove through the source and realized how far away from the Gulf of Mexico I actually was. Don’t misunderstand, border control has a job to do and everyone is subject to the secondary inspection – today it was me. Like I said, everyone was professional and courteous. I did get to see a “border control” issue when some idiot “forgot” he had a gun in his vehicle trying to enter Canada. Really and truly, not the best idea in the world. For anyone going north of our border, Canada is a great place (and I’m planning to go back often), but, it is ANOTHER COUNTRY. While many of the laws are similar, there are many that are different and the punishments are often times much harsher than ours. In other words – “DON’T BE STUPID”. 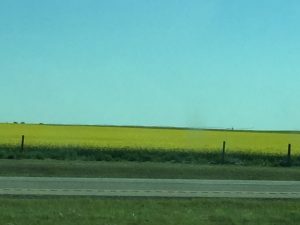 The only thing different along the way was that much of the wheat that was just starting to grow in early June was now heading out and the crops that I couldn’t identify turned out to be canola. 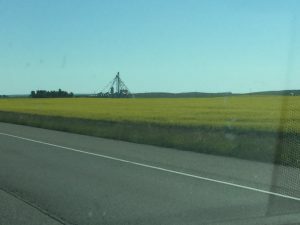 Here are a couple of pictures of blooming canola and an old-fashioned grain elevator along the road. After re-entering the USA, I-15 head south through Great Falls and then on to Helena (the capital) and Butte. Once again I was reminded that there are majestic, scenic, open spaces in this country as well. I-15 basically follows the Missouri River south out of Great Falls to it source in the “Big Belt” Mountains. Crossing the Continental Divide (I was wrong, I wasn’t through with steep grades quite yet), you make your way into Butte. Unfortunately, Butte’s majesty is being destroyed by open pit mining which, while necessary for our lifestyles, does take away from a pretty area. Taking I-90 east out of Butte, you once again climb into the mountain and re-cross the Continental Divide (I think for the last time) and drive through some more scenic, twisty, mountainous terrain. As you come out of the mountains, you follow several rivers, including the Gallatin, and on in to Bozeman. Bozeman is the home of Montana State University and is a picturesque town in its own right. Tomorrow its on to Denver – another 550 miles or so. I’ll stay a day or so at my sister’s and then drive home from there. Hopefully, home on Thursday. As I said in the last post, today was a true rest day. For all practical purposes, the rest of the trip is heading home and there’s really no new sights that I anticipate. Of course, if I see anything that I consider interesting, I’ll take a photo and post it. If you’ve ever travelled, especially by car, there’s always the point where you are just headed home. That’s me right now. Longer drive today as I have another “rest” day tomorrow here in Calgary. The drive today retraced my route along BC99 to BC97 and I then turned south and east towards Cache Creek, BC. In Cache Creek I turned onto Canada Hwy 1 (on the the trans-Canadian highways) and headed east. Next was Kamloops and several impressive lakes (along with developments and golf courses) and lots of steep grades (up to 10%). From Kamloops, the next major town of note was Salmon Arm which is built on a lake and its sawmill “floats” delivered logs to the mill. Really neat to see in person. In Golden, BC, CAN1 jags into the Canadian Mountains National Parks. This is a series of national parks and preserves that rival or outclass anything in the US. 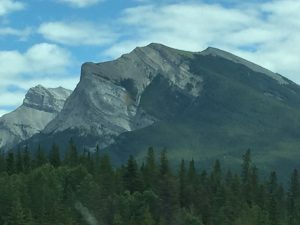 I crossed the Continental Divide somewhere between Golden and Banff and then headed into the plains towards Calgary. 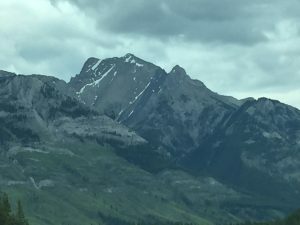 Here are a couple of pictures of some of the peaks in and around Banff. Maybe not the best pictures, but, with very few exceptions, all the pictures I posted were taken inside or just outside my truck. Another milestone on this trip occurred today, this is the last time I will cross a major mountain chain. All of the roads and highways from here to home are on the east side of all the mountain ranges in the western US and Canada. 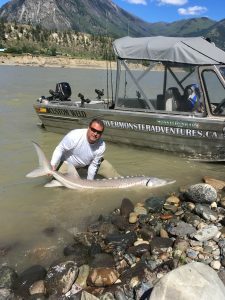 Spent the day with River Monster Adventures and Guide Dylan Harder. I had a blast and would recommend the trip to anyone. 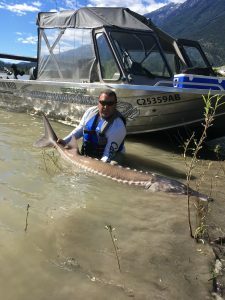 It is done catch-and-release only as the white sturgeon is protected (both US and Canada), but each fish is tagged and then tracked for statistical purposes. So, here are some pictures of the fish I caught today. This is the largest, a tad under 8 feet long and about 275 lbs (or more, we didn’t weigh it). 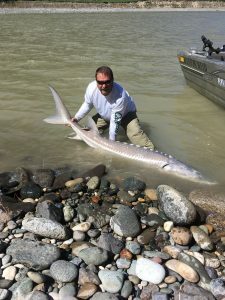 The unique thing about this fish is that it had never been caught before. 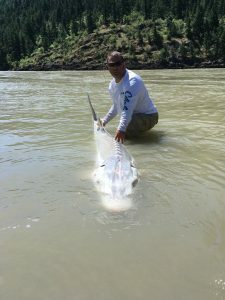 At likely more than 100 years old, and the fishing pressure on the river, that is amazing to me. Here is a picture of the river and surrounding mountains (yes the sky was that blue). 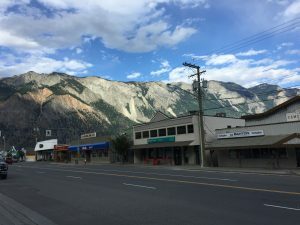 Here’s a snapshot of downtown Lillooet, BC. Tomorrow, its back to Calgary, AB and another rest day on Saturday. Again, not a lot of pictures today (well one of a logging truck that I got stuck behind for about 45 minutes) that would be of any interest to anyone but me most likely. Today was a shorter drive, only 330 miles, and the first 290 or so were pretty ordinary as far as this trip has gone. Prince George is a little bit larger town and had a good “vibe” to it. Make no mistake, its an industrial town, but the town feels comfortable and modern. Traveling along the “Caribou Highway”, or BC97, you snake yourself south towards Vancouver. Plenty of ups and downs but nothing to severe. That was, until I turned onto BC99 which is the “Scenic Byway” to Vancouver through Whistler (think winter olympics). BC99 is another road that I feel (my opinion) everyone should drive. While I followed the Fraser River most of the day, BC99 follows the Fraser River Canyon which is a spectacular, “Oh My God!” type road. 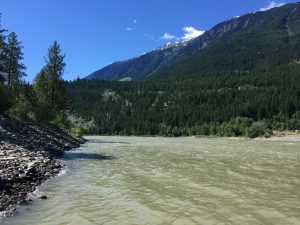 The highway itself is a couple thousand feet above the river, and you can’t see it for most of the drive into Lillooet, but it is stunningly amazing. To see hay fields and pastures on the terraces above the cliffs down to the river makes you wonder who thought to do that. The only caution is for those that get claustrophobic or have a fear of heights. They will both get you. Also, if you have problems driving on steep grades (9% and greater), this is not the road for you. The first sign you see states: “The speed limit is 100km/h, but whose your own good sense on how fast to drive.” I don’t think I got over 80km/h for the 40 or so miles that I drove. Again, WOW! 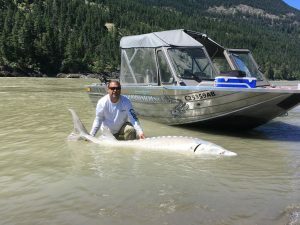 Tomorrow is a white sturgeon fishing trip on the Fraser River (catch and release only), so I’ll update either tomorrow or on Friday when I get to Calgary, AB. Today was a true rest day. I did go to The Black Clover for lunch and walked around the block. Dinner will likely be at the Copper Pig BBQ and that’s just across the street. Otherwise, for the first time since June 1, I did absolutely nothing today. That all changes tomorrow (and the rest of the month for that matter), so, I think I’ll go back to watching TV.